Is there global evidence that neonicotinoids harm bees? Certainly, concerns about the impact of neonicotinoids on bees and other wildlife, have been raised all over the world, by beekeepers, independent scientists, members of the public and conservationists in many countries: Japan, Australia, Europe, USA and Australia. Of course, the fact that governments have not issued outright bans tells us little – it certainly provides no reassurance that these insecticides are safe for bees or other wildlife. (UPDATE: Some moves to ban neonics have happened in Europe since this page was written). In any event, in some cases, those responsible for banning them (or influencing whether or not they should be banned) would be those who were at least partially responsible for having registered them in the first place, or having supported the agrochemical industry in doing so – example: the influential Dr Helen Thompson, UK ‘chief government bee scientist’ and eco-toxicologist who worked alongside the pesticides industry many times, and will be joining Syngenta in (September 2013) - see this report. Whilst our regulators and industry deny the dangers of neonicotinoids to bees, in the face of flawed regulatory procedure and agrochemical industry influence, can the independent experiences and research of scientists, beekeepers, conservationists and intelligent public, be wrong about neonicotinoids? Here are just a few examples of concerns raised, snippets of information, reports and sound bites from around the globe. The Google/Bing search engines are available for those who wish to look for further resources, and perhaps those who have the time to seek out relevant translation terms for stories printed in languages other than English. In the UK especially, the Australian situation has often been cited as that neonicotinoids are used widely with no reported impact on bees. This is false, and has been discussed previously on this website here. More recently the Australian regulatory authorities raised their concerns about neonicotinoids – read more. Neonicotinoids were identified as responsible for 91.4% of the 11,533 damaged honey bee hives in 2009, and 81.7% of the 8,328 losses in 2010. Also, a presentation regarding concerns in Japan about neonicotinoids with regard to environmental and health impacts. Xerces – Are Neonicotinoids Killing Bees? 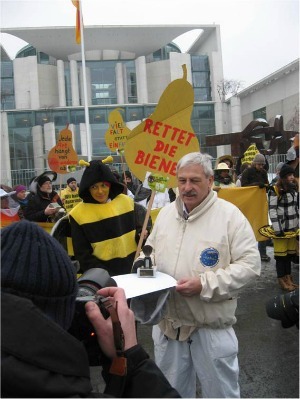 Tom Theobald – a beekeeper campaigning against neonicotinoids, having direct experience of the impact of neonicotinoids on his honey bees - on Dan Rather and his response to the EPA scandal of allowing pesticides on the market with incomplete testing. Also: Report on effects of neonicotinoids on grassland birds. EFSA find that neonicotinoids imidacloprid, thiamethoxam and clothianidin pose unacceptable risk to bees, and propose restrictions to their use. EFSA find Fipronil poses unacceptable risk to bees, and proposes restrictions. (The restrictions do not go far enough in my view – read more). EFSA examine UK bumblebees study conducted by FERA (Helen Thompson et al) and find there is no reason for them to amend their position on neonicotinoids, due to weaknesses in the study design. Note, the UK government 'bee scientist' went to work for Syngenta in 2013: http://www.theguardian.com/environment/2013/jul/26/government-bee-scientist-pesticide-firm ). Presentation: Hedwig Riebe, DBIB: Exposition Paths of Neonicotinoids 2009 (This is a powerpoint presentation. Hedwig Riebe is from the Deutscher Berufs und Erwerbs Imker Bund e. V. in 2009 (German Beekeepers Association). – A small experiment to monitor what would happen to bees in clothianidin treated crops, whether they would drink guttation and other contaminated drinking routes for bees. Link between neonicotinoids and Varroa in honey bees. Photo below: German beekeepers protest and award Angela Merkel with a black brush for always taking the side of industry. One of her "special advisors" is Hr. Hambrecht, the head of BASF. The brush is so she can pollinate food crops herself. The brush has been awarded by German beekeepers for the last 7-8 years to the person they judge to have most harmed the beekeeping community. How do neonicotinoids work? A look at the claims made by BayerCropscience for effects of their neonicotinoid on termites, and a comparison with reported effects on bees. Neonicotinoids and non-target insects - a look at the evidence from industry patents.